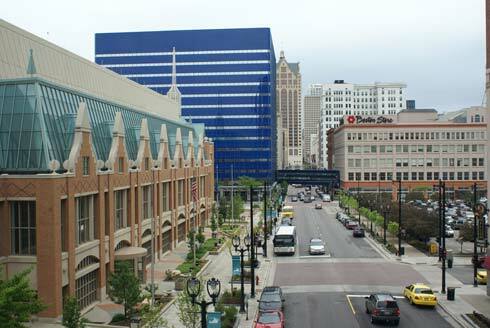 People say that the Bead & Button Show in Milwaukee, Wisconsin is the most popular bead show in the whole world. And they are right! And not only because company representatives, instructors, students, and vendors from numerous countries come to the show, but also because it features the best known beading contest in the world – “Bead Dreams”. This year students and exhibiters from more than 30 countries came to the Midwest Airlines Center in downtown Milwaukee. It was a full week of beading, jewelry making, shopping, meeting friends and talking with them about beads! The main event of course was the Bead Dreams exhibit. Lora Groszkiewicz, who, as usual, was responsible for receiving entered works, told me that “we had submissions from designers from the U.S., Japan, Canada, Russia, the United Kingdom, Italy, Ireland, Sweden, Latvia, Ukraine, Israel, Australia, New Zealand and Singapore.” Works of all finalists were on display in the show's lobby area. The winners in six categories received award ribbons and the outstanding piece among category winners received a Best-in-Show trophy. This year it was “Early Summer Wedding Bouquet” made by the four Japanese beaders – Miyuki Sugimura, Hiroko Toda, Masako Kato and Akemi Hara. There were two additional displays this year. One was the Japanese exhibit (sponsored by the Coronet Co., Ltd. and the Japan Association of Leisure and Culture Development), which presented the top award-winning pieces from the beadwork and jewelry contest held in the Hakone Open-Air Museum. 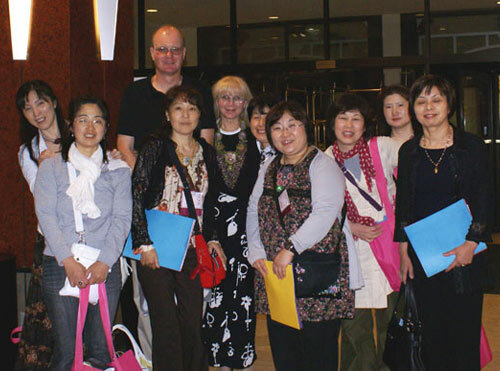 This contest was hosted by the International Craft Artist Association, which aims to cultivate creative artists in Japan. The centerpiece of this display was the amazingly beautiful necklace made by Hiroe Takagi which won the Gold Medal. The other traditional exhibit of the International Society of Glass Beadmakers called “Out of the Box” presented the individual glass beads, beads made into wearable art, and beads incorporated in turned wood objects. Those who came to the show to improve their skills could chose from among more than 500 classes taught by the leading masters of North America and other countries. For those who came to shop the show was simply a paradise. 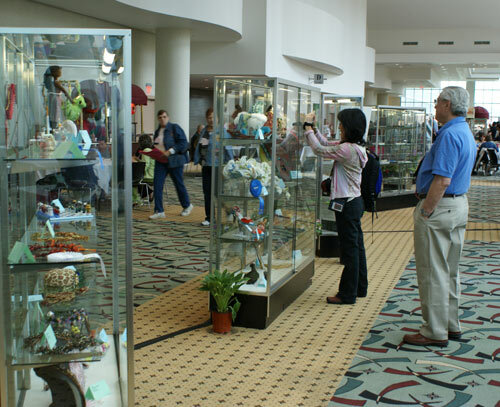 The Bead Marketplace featured more than 360 exhibitors offering unique components, focal beads, tools, books, gemstones, and many other items. In short, I looked around the exhibits, was very impressed by all the things I saw, bought lots of new beads and cabochons, and then came home and right away started on my new work for Bead Dreams 2009!